Released October 30, 1916, A Troublesome Trip is a one-reel Black Diamond Comedy filmed and produced by the United States Motion Picture Corporation (USMPC) in Wilkes-Barre, Pennsylvania. The film was distributed by the Paramount Pictures Corporation, New York. 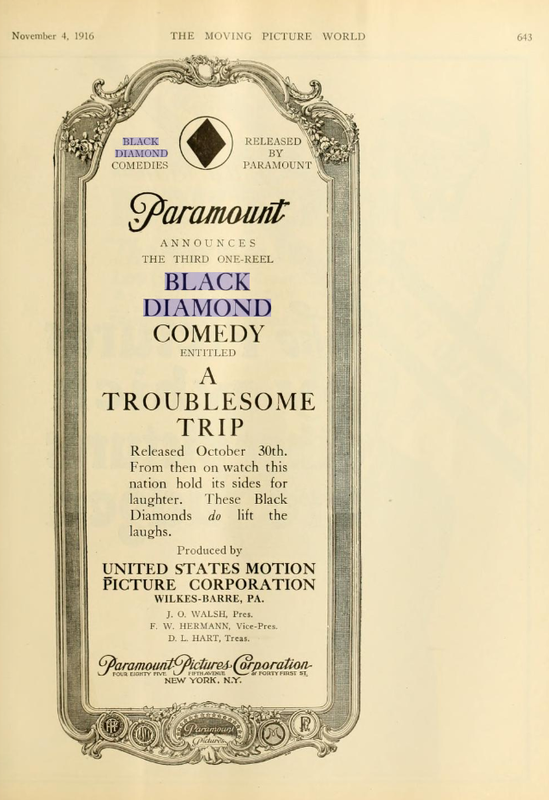 An advertisement for the film that appeared in the November 4, 1916 issue of The Moving Picture World notes that it is the third Black Diamond Comedy released by Paramount Pictures. As of the writing of this article (October 21, 2012) no prints of this film are known to survive. If you have any information about the film, please contact us. Box Car Bill and Journeying Jim, two typical hoboes, awake in a hay-stack and are chased out of the field by a bull. They arrive at a lunch-wagon near the far terminal of streetcar line and sit on the steps, pining for a meal. The lone street-car of the “Lazy Line” reaches the terminal and the crew, leaving their caps on the car, run into the lunch-wagon for a bite before starting back. A crochety travelling-man, in a hurry to catch a train, paces up and down beside the car, looking for the crew. The tramps hear him say to himself “I’d give five dollars to make that 4.30 train.” They get an inspiration, sneak into the car, put on the caps of the motorman and conductor [unreadable] the traveler, saying “Give us the five, we’ll get” [unreadable] and speed down the track. People on the [unreadable] car and the boys decide they might as well get [unreadable] fares they can. A girl with a dog, an old lady with a cat, a fat man, an Irishman with a goat, a woman with two mischievous children, a dude, a loving couple, several pretty girls and many others get on the car and furnish many different kinds of trouble for the crew. Unable to back up for a passenger, they pick up the car and turn it around. Another time as Bill is helping a lady off, Jim starts the car and leaves Bill far behind. Bill seizes an old fashioned high bicycle from a small boy and chases after the car The car crosses a bridge and Bill rides up the girders and across the top of the bridge. He jumps from the bridge to the trolly wire and rides on that until he hits the trolly wheel of the car. This throws him off and he falls through the roof of the car and goes on about his business of collecting fares. When the real car crew find that their car has been stolen, they telephone the car barns and several carmen are sent out with another car to stop the thieves. The two cars meet at full speed. A bad wreck seems inevitable. The tramps, however, jump their car right over the other car and continue on down the track. A broken bridge looms up ahead but the tramps fail to see the danger sign and the car crashes through the bridge and into the river. As a finish, the two tramps float down the river on the top of the broken car, dividing their profits from the trip. The foregoing story, A TROUBLESOME TRIP, was written and worked out by the following persons, all citizens of the United States of American, and all in the employ of the United States Motion Picture Corporation [unreadable] Taylor, James O. Walsh, Joseph A. Richmond, William [unreadable] Harris and Horace G. Plimpton, Jr.